Home Politics National Politics Roberts Tells Belmont Audience High Court Isn’t Political. Say What? 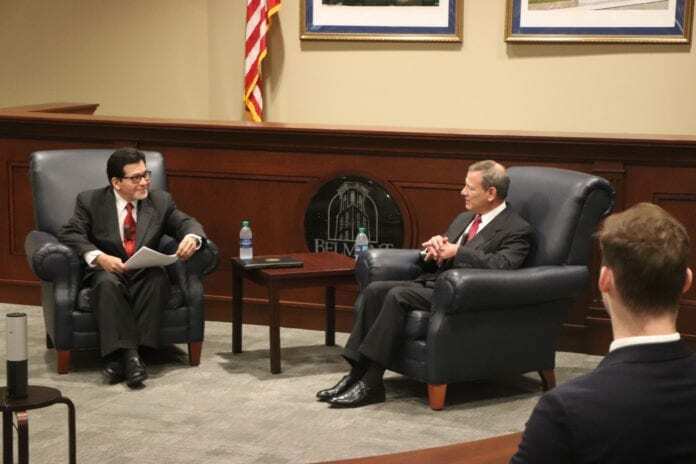 Belmont Law School Dean Alberto Gonzales chats with Chief Justice John Roberts February 6. NASHVILLE, TN – For a couple of guys who profess to be above politics, Alberto Gonzales and John Roberts are sunk up to their eyeballs in it. 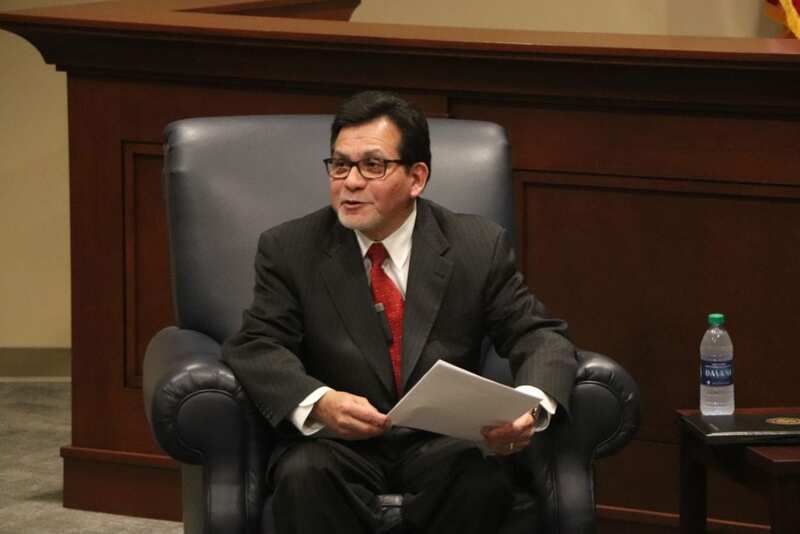 Gonzales, Dean of Belmont University’s law school, was Attorney General during the George W. Bush administration. He is the son of poor Mexicans. Roberts went to private schools and then Yale. Despite their different backgrounds, Gonzales and Roberts are more alike than you’d think. They each rose to prominence through hard work and the good graces of powerful politicians, specifically, both George Bushes. Roberts held posts at the Department of Justice and Office of the White House Counsel during the Reagan and H.W. Bush administrations. George W. Bush nominated Roberts to be Chief Justice of the Supreme Court in 2005. Gonzales invited Roberts to Belmont this week to answer questions posed by Belmont law students in front of an audience of law professors, current and former judges, state officials, and invited dignitaries. It was a precious occasion and no questions from the press were allowed. The two men talked about the law, the Supreme Court, and its special role as one of three counter-balancing branches of government enshrined in the U.S. Constitution. The framers gave the separate branches distinct duties to prevent other branches from exercising too much power. “The framers knew what a judge was. When they said the judge has to decide cases and controversies they obviously meant according to law not according to policy. We, in the Judicial Branch, shouldn’t be deciding all sorts of policy decisions that go on in other branches,” Roberts said. But since the President appoints federal judges and Justice Department officials like the Attorney General, the thumbs of powerful Presidents often tip the scales of American justice. During their hour-long conversation, neither Gonzales nor Roberts mentioned the Bushes, the father and son duo who propelled them onto the national stage by appointing them to high office. Instead they talked shop and Gonzales asked Roberts what duties Brett Kavanaugh had as the high court’s newest member. Roberts said he has to answer the door when somebody knocks and take complaints about food in the cafeteria. No mention of Kavanaugh’s deciding vote to end Roe v Wade, or overturn the Affordable Care Act, both highly political cases that the Supremes will likely decide in coming months. “Should people think about the court and the justices differently than either being a conservative or a liberal justice?” Gonzales asked. “The categories aren’t that significant in any particular case,” Roberts answered. He said that while justices may be confirmed along party lines, conservatives often turn out to be more liberal than you would expect and vice versa. “People need to know we are not doing politics. They need to know that we’re doing something different, that we’re applying the law,” Roberts said. Were that only true. Both Gonzales and Roberts were pliant tools of Presidents who used them to politicize the judiciary and they went along with it. Former Attorney General Alberto Gonzales talks with Chief Justice John Roberts at Belmont Law School. 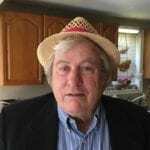 In the early days of the War on Terror after 9-11, Gonzales was working in the White House and provided legal cover for Bush to order the rendition of enemy combatants, hold them in overseas prisons where they could be tortured any time for any reason. “The problem with Gonzales is that he has been deeply involved in developing some of the most sweeping claims of near-dictatorial presidential power in our nation’s history. These claims put President Bush literally above the law,” wrote Stuart Taylor in a 2004 Atlantic article. Gonzales drafted a Bush 2001 order creating military commissions to try suspected terrorists for war crimes without the right of habeas corpus. In January, 2002 Gonzales sent Bush a memo that claimed prisoners seized in Afghanistan did not have protections afforded by the 1949 Geneva Conventions, which he called “quaint” and “outdated”. Bush then refused individual hearings for the hundreds of alleged “unlawful combatants” held in Guantanamo. In August 2002, he gave Bush one of what became known as the “torture memos”. The DOJ sent it to Gonzales who had vetted it earlier. Essentially, it argued the President has virtually unlimited power to authorize torture in wartime interrogations. Some, but not all, of those methods have since been outlawed and some, but not all, Presidential excesses have since been curbed by various courts. 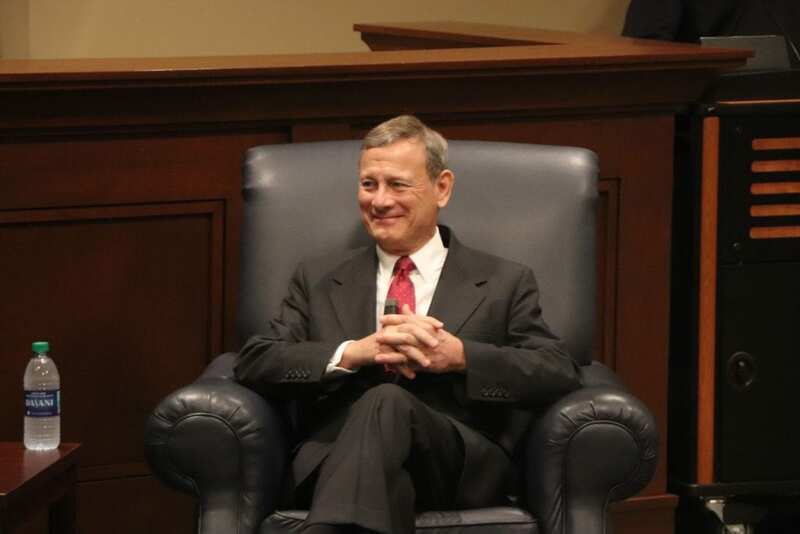 Chief Justice John Roberts Speaks at Belmont Law School February 6. Roberts was on the U.S. Court of Appeals for the District of Columbia Circuit when he joined a unanimous reversal of the lower court’s ruling in the case of Hamdan v Rumsfeld. Salim Ahmed Hamdan was Osama Bin Laden’s driver and Roberts held that he could be tried by a military court and that the Geneva Convention did not apply to him. Ironically, that decision was overturned by the Supreme Court in a 5-3 decision in 2006, a year after Roberts became Chief Justice. The 2010 Citizens United decision, which Roberts wrote, changed the political campaign finance laws by defining corporations as people. In a 5-4 decision the court decided that as a legal person, companies had 1st Amendment Rights so they could pretty much spend whatever they wanted to elect a candidate. Direct giving limits were not changed but different sorts of political PACs could funnel tons of cash, and dark money has flowed, into elections ever since. That may not be what Roberts intended but it’s what his decision has wrought. In Shelby County v. Holder (2013), Roberts delivered the 5-4 decision striking down a part of the 1965 Voting Rights Act. The majority held that states which had a history of racial discrimination no longer had to show that their voting laws or practices did not suppress voting rights. In the 2018 midterm elections voter suppression of various kinds and voter purges occurred in North Carolina, Georgia, Texas, Florida, and Tennessee. Roberts has no clue that we are not beyond the “insidious and pervasive evil” of racial discrimination cited in the 1965 Voting Rights Act. Roberts said criticism doesn’t bother him. Maybe it should.